This is the sweet looking Nike Victory Red Fairway Wood. I'm a big fan of the design of this club. The shape is traditional. It is the classic pear shape, which makes it look good at address and gives me confidence in my ability to work the ball. The pear-shaped look is the only thing that is traditional about this fairway wood. I love the flashy branding with the red highlights. I think it looks like a racecar that goes super fast. The biggest claim to fame is the STR8 Fit technology. The club is adjustable to 32 different positions. Thus, buying this driver is almost like buying 32 drivers. This is four times more than Nike's previous Str8 Fit technology that provided eight different positions. Finally the combination of the 455 steel and the Split Compression Chamber makes the golf ball jump off of this hot face and go long. I recommend this club for the lower handicappers, because the shape of the head is more of a player's shape for working and controlling the ball. This is somewhat contradictory, because I believe the matching model in the driver, the Nike Victory Red STR8 Fit Tour Driver, is more versatile and can benefit all players. 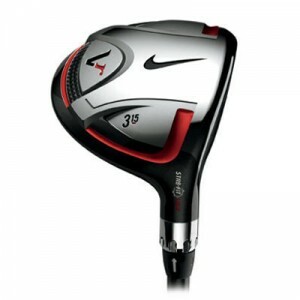 I would steer higher handicappers towards the Nike SQ Machspeed 3 wood.